At $260, today’s review of the MSI Z97 MPower Max AC is the odd one out of our initial Z97 reviews. The previous two reviews both use SATA Express to expand their storage options; however the Z97 MPower Max AC diverts this investment towards other features, such as an integrated power delivery water cooling system and more USB 3.0 ports. Given the lack of SATA Express drives on the market today, we examine the MSI motherboard to see if this means much for future-proof system building. As the big focus of Z97 is supposed to be on the new storage features, it might come as a bit of a surprise when a high-end motherboard does not have all the ports needed to provide them. There could be two reasons for this – either the lack of drives on the market, or because it makes the PCIe lane routing easier. With no SATA Express drives on the market, using that new feature becomes a future play, requiring a strong market and uptake of suitable products available. While users often invest in a PC for it to remain future proof and still be alive and kicking with the best of them in three to five (or even seven) years down the line, predicting where the storage market might be requires channelling the spirit of Storage Future. Even Jacob Marley cannot help you there. SATA Express could take off, or fall flat on its face, or be a long tapered out affair similar to Thunderbolt adoption. We do not know which way for certain, and neither do the motherboard manufacturers. 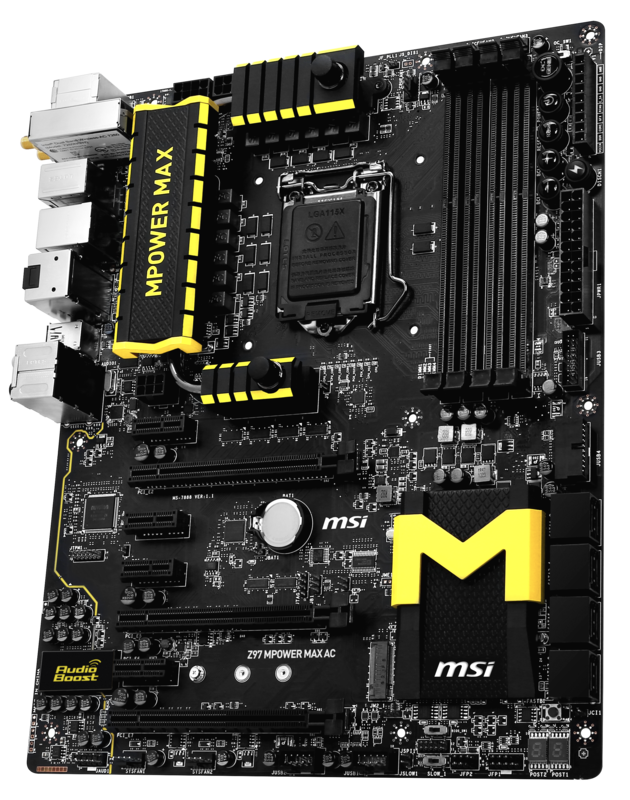 MSI, on this Z97 MPower Max AC, has decided to put its eggs into M.2 (users can select between M.2 or two SATA ports), but not SATA Express, whereas the other motherboard manufacturers, when sending us their launch products, are hoping that SATA Express takes off. Overclocking motherboards occupy an odd niche in the market. While their focus on overclocking features should be number one, very few manufacturers go all-in on the idea, especially when considering extreme overclocking using sub-zero coolants. This is because such a motherboard requires a lot of research and development for what is actually a very small crowd in terms of sales numbers. Thus a balance has to be made between extreme overclocking features and normal every day features, such as onboard audio and networking capabilities. It has to appeal to users who want a PC under their desk as well as those who want to mount a 3kg copper pot and aim for 6 GHz and up. 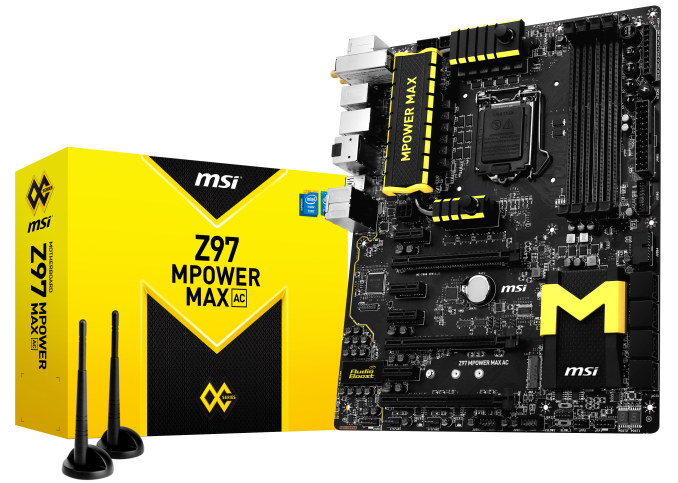 The Z97 MPower Max AC from MSI attempts to meet that middle ground. As the name suggests, we have 802.11ac on board. MSI has developed a rear panel mounted system for its wireless card, which is actually a 2T2R Intel AC7260, and include two antennas in the box. This WiFi is coupled with an Intel I218-V NIC for networking. MSI has gone for a total of 12 capable USB 3.0 ports on the board, four from the chipset, six from an ASMedia hub and two from an ASMedia controller. This is two to six more than most motherboards, and gives two onboard headers for cases that can take advantage of this (with the case ports being chipset powered rather than via a controller). In a similar style, we have two additional SATA 6 Gbps ports, making eight total. 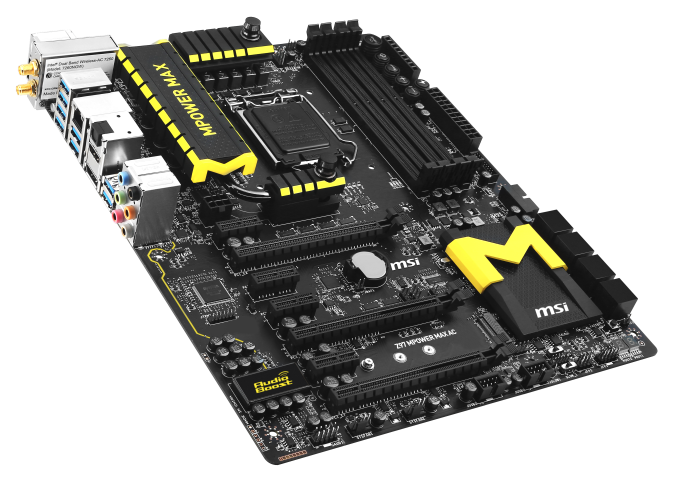 Like other manufacturers, because MSI has used an M.2 connector on the motherboard that shares bandwidth with two of the chipset based SATA ports, the board has an ASMedia controller to add those two extra SATA 6 Gbps so that when the M.2 is in use, there are still six ports possible. Because the Z97 MPower Max AC is aimed at mid-range overclocking, the power delivery heatsink doubles up for water cooling, being an air/water hybrid solution. We have seen this on other motherboards before, but I think I am right in saying that this is MSI’s first take on the combined solution. Like with other first attempts, the solution has fixed sized barbs at 3/8”, and MSI suggests flowing cooler water into the top with warmer water out of the bottom. Other overclocking features include BCLK adjustment buttons, a ClearCMOS button on the rear panel, voltage read points, a discharge button to help remove current from the capacitors, a two digit LED that doubles up as a temperature readout when >0 and a Go2BIOS button that ensures the next restart will enter the BIOS. The BIOS gets minor upgrades, but I am glad to say that MSI has read a few of my reviews and taken some ideas on board! The BIOS now has an XMP button at the top for a one click XMP, and the overclocking menu is now split into the sections for a better user experience. The overclocking menu also has an easy/advanced mode, wherein extreme overclockers can get access to more options for sub-zero overclocking. The fan controls in the BIOS are also upgraded, giving users a proper graphical control of the power vs. temperature graphs at each of the gradient points. There is still a small jump for MSI to move from power vs. temperature to RPM vs. temperature with proper fan testing tools, but hopefully MSI will add this in time. Software is also upgraded, with a new version of Live Update 6 also taking some of my ideas onboard – we can now see the size of a download before the system wants us to download it. The Command Center software still tries to simplify overclocking and enabling a RAMDisk, but it still offers users an easy way to apply 2.1 volts to the CPU. There were a couple of highlights on the performance charts, with the Z97 MPower Max AC going under 18.5 minutes for our Agisoft test and scoring 53 microseconds in the DPC Latency test. There was no discernable difference between the chipset and ASMedia based USB 3.0 ports, and manual overclocking saw 4.6 GHz on our sample, similar to the other Z97 motherboards tested, however it was a few degrees warmer than the others. The manual overclocking was very conservative, with OC Genie boosting the CPU to 4.0 GHz only. I would have preferred a 4.2 GHz minimum overclock here at least. The MSI Z97 MPower Max AC gave a couple of minor non-critical issues during our testing, such as Live Update 6 unable to update itself, but overall it was very nice and easy to use. The changes in the BIOS make me happy, as it shows that MSI is willing to take on board both constructive criticism and ideas. The MPower Max AC still gives a wide array of connectivity, and as it does not follow the SATA Express train like our previous reviews, the number of devices sharing bandwidth is low making it easier to figure out. The direct comparison to the Z97 MPower Max AC at $260 should be with the Z97 MPower at $200, and the Max version includes the WiFi card, the combined air/water VRM cooler, two more USB ports and a bit more in the box. It is hard pressed if that is worth an extra $60, but for those going the water cooling route the MPower Max is a nice motherboard to consider. 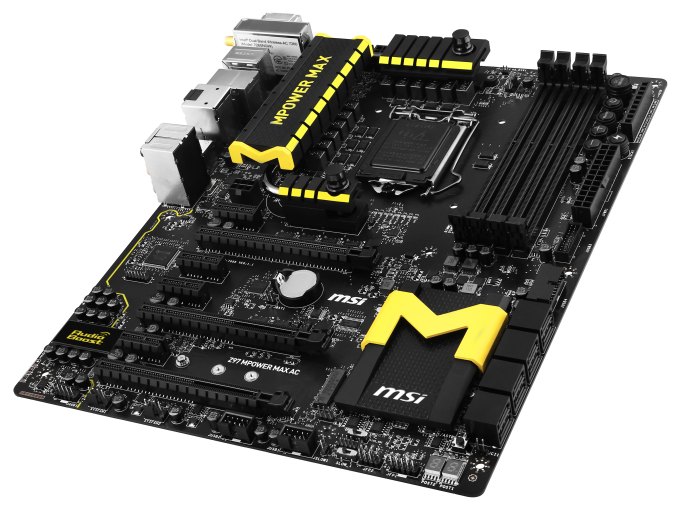 MSI’s overclocking motherboards for Z97, like those for the 8-series, will use a black and yellow color scheme with a heavy emphasis on the contrast between the two making the yellow more the trim color. The color extends out to the audio segment of the motherboard which uses white LED lighting underneath to generate a soft yellow glow through the semi-transparent PCB elements. Amusingly however the other LEDs facing out of the motherboard are either green (two-digit debug, BIOS selection), red (BCLK adjustment buttons) or blue (OC Genie), which could spoil the look unless the motherboard was used in a build that was similarly styled in a black/yellow theme. The socket area of the motherboard has no visible Intel guideline like most; however the capacitors used in the socket area are flat to aid extreme overclockers in motherboard preparation. Users with tall DRAM and large heatsinks might have issues left to right with fitting large CPU heatsinks in, but this is common without additional space between the socket and the RAM slots. The socket area has access to three of the five fan headers, with the three all to the right of the top power delivery heatsink. The final two fan headers are at the bottom of the motherboard, and all the fan headers are four-pin. The power delivery heatsink is looped around three sides of the socket, with the pipe joining them being the tubing for the water system. The biggest heatsink does not seem to have much in the way of surface area to remove heat; however with our closed loop liquid cooler the power delivery was fine to our maximum overclock. It is still recommended that a fan is present near the IO panel in a case to encourage airflow over the air/water combined heatsink for the power delivery. MSI is using dual-sided latches for the DRAM slots rather than the single-sided latches we see on other high end models. MSI has used single-sided latches in the past, such as on the Z87I, however MSI’s Lightning graphics cards tend to have back plates which might be in the way of the latches, so MSI tends to save this for situations where the first major PCIe slot is up against the DRAM. The top right of the motherboard has the Easy Button overclocking features from previous Z87 MSI motherboards. At the top is an OC switch which has two modes for the OC Genie button, giving a light or a heavy overclock when OC Genie is active. Next is the OC Genie button, which applies an automatic overclock (from a look-up table) from a system booting, followed by the power and reset buttons. The next two buttons are BCLK adjustment buttons, which when the relevant driver is installed in the OS allows the user to adjust the system BCLK in 1 MHz or 0.1 MHz increments. The big button with the thunderbolt icon is the discharge button that completely grounds the system and resets the BIOS. In between all these buttons are the voltage check points with three GND points. 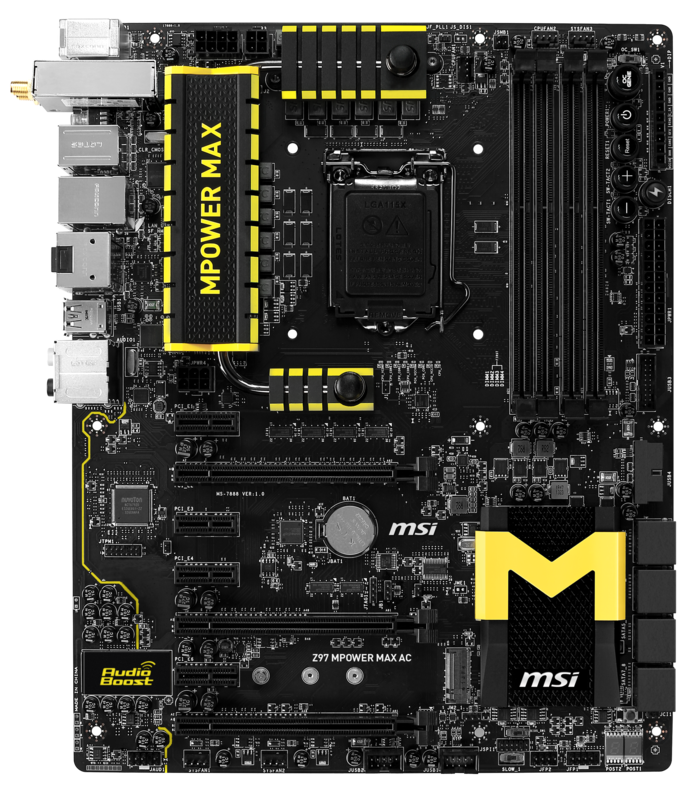 MSI has gone a little odd with the USB 3.0 header placement under the 24-pin power connector by giving one at a normal position on the board for a header, and another at right angles. I would suspect that MSI received some feedback from a group of users asking for a USB 3.0 port at right angles, hence its inclusion, however normal upright headers would have been fine with me. Next follows eight SATA 6 Gbps ports. These are confusingly labeled 1-8, except the final two (SATA7_8) are from an ASMedia controller. Because these are from a controller, they have different SATA modes than the chipset based ports, and as such without looking in the manual it might be frustrating to set up a hardware-based array. The fact that the controller ports are the same color as well compounds the issue. It should be mentioned that the SATA5_6 ports also share bandwidth with the M.2 slot which can be found on the other side of the chipset heatsink. The chipset heatsink is lavishly adorned with a big yellow M on it, with the same surface area patterning as the bigger power delivery heatsink. At the bottom of the motherboard, starting from the right, we have the two-digit debug LED that doubles up as a temperature output when the OS has been initiated. Following this is the front panel header (users will need to look in the manual to find out which pin does what, which I find is rather annoying rather than just printing on the PCB), a BIOS switch to select between the two BIOS chips, and a Slow Boot switch. Using the Slow Boot switch, overclockers can enter the operating system at a low frequency before they initiate a high frequency for the benchmark. This usually helps to keep the system stable when it is set up right. The rest of the bottom of the motherboard contains a pair of USB 2.0 headers, two 4-pin fan headers, and the front audio header. The audio portion of the motherboard is similar to that on other high end Z97 models - an enhanced Realtek ALC1150 solution based on PCB separation, filter caps, headphone amplifiers and EMI shielding. Like some of the other manufacturers, MSI likes to promote the gold plated connectors in the rear panel audio. The rear panel is ordered slightly differently to other similar motherboards, by virtue of the WiFi module being at the top of the motherboard and the video outputs further down. This is because the WiFi module, a 2T2R Intel AC7260 based chipset, is actually an add-in module that the user has to screw to the motherboard before placing it in the case. We have had this sort of arrangement with the first generation of ASUS rear IO modules, which now come affixed to the motherboard on delivery, so I assume that the MSI ones will follow suit in due course. Elsewhere on the rear panel we have a combination PS/2 port, two USB 2.0 ports, a Clear CMOS button, six USB 3.0 ports from an ASMedia ASM1074 hub, an Intel I218-V Ethernet port, HDMI and DisplayPort outputs, two USB 3.0 ports from an ASMedia ASM1042 controller, and the audio jacks. Using a USB 3.0 hub and a controller to get twelve total USB 3.0 ports seems a little odd, however our testing puts their performance (using one USB device at a time) on a similar level. Normally I dislike motherboards with 2 or fewer USB 2.0 ports for when I install a non-UEFI OS via USB, because I ideally need three USB 2.0 ports (mouse, keyboard, USB stick). However the MSI’s USB 2.0 ports failed to initiate during my install and only the two USB 3.0 ports under the Ethernet port worked. This seemed fairly odd. The big features here are the combination air/water power delivery heatsink, twelve total USB 3.0 ports, Intel 2T2R 802.11ac included, eight SATA 6 Gbps ports and upgraded Realtek audio. I should mention that the PCIe layout gives x8/x4/x4 for three-way CrossFire or x8/x8 for SLI, and despite there being a heatsink above the first PCIe slot this is NOT a PLX8747 enabled motherboard. Because MSI did not pursue PCI ports, this left room for four PCIe 2.0 x1 slots from the chipset, and they went down this method rather than a PCIe 2.0 x4. Perhaps MSI should have taken out one of those x1 ports and added another Intel NIC on the rear panel, or removed two for another M.2 x2 slot, just to expand out some of the functionality of those PCIe lanes from the chipset.